Meet the Inspiron 15 — a 15.6-Inch laptop computer for your everyday needs. With an attractive, stylish design and mobile technology, this laptop features everything you want for everyday computing. 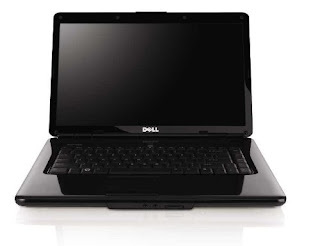 The Inspiron 15 offers a modern black palmrest. Not to mention Intel Core 2 Duo processors, a Dell Dock and optional facial recognition software, all at a value within reach. *Based on Dell Lab testing. Battery life varies by configuration, operating conditions and other factors. Maximum battery capacity decreases with time and use. Stay connected wherever you roam with the Dell Inspiron 1545 laptop in black, which features a bright, vivid 15.6-inch LCD screen and long-lasting 6-cell battery. Weighing just under 6 pounds, it's a great choice for both work and play with the screen's high-definition resolution and included DVD drive (which can also burn dual-layer DVD and CD media). You'll enjoy dual-core productivity from its 2.1 GHz Intel Pentium T4300 processor for excellent multitasking. Other features include a 250 GB hard drive, 4 GB of installed RAM, 54g Wi-Fi networking, 7-in-1 memory card reader, ExpressCard 34 slot, Intel GMA 4500MHD graphics with video memory shared with the system, and pre-loaded Microsoft Works. 1.3 megapixel webcam with facial recognition software automatically secures your computer when you're away. This software adapts to your changing looks so you can expect faster login times. Also, there's no need to remember numerous passwords for password-protected Web sites. Dell Dock: Enjoy a cleaner desktop with this application organizer. Installed software applications on your PC are automatically sorted into user-friendly categories placing your most frequently used programs front and center. Dell DataSafe Online backup service offers data protection by enabling customers to back up data to a safe, remote storage site using a broadband connection. Dell DataSafe Online is easy, flexible and secure. After setup, it will automatically back up data and help protect against software, hardware and catastrophic failure. With Dell Remote Access you can easily access photos, music, movies and more on your home system using another Internet-connected computer. Dell Support Center: This centrally located, easy-to-use application provides personalized support resources. Conveniently located on your PC's desktop with quick links to service, support and system resources. Helps keep your system up-to-date and running efficiently through automated fixes for common configuration issues. This notebook has a 15.6-inch TFT display with a resolution of 1366 x 768 pixels (native 720p for high-definition viewing). It also provides TrueLife high-gloss/anti-reflective technology, which features a sharp contrast finish that's well suited to immersive 3D games and watching videos. Its widescreen 16:9 aspect ratio is designed to present websites without lots of left-right scrolling, as well as with a smoother line of sight. Video is powered by the Intel Graphics Media Accelerator 4500MHD, which uses shared video memory (up to 1750 MB allocated from the system memory). This graphics card is built with Intel Clear Video technology, which delivers clearer, more detailed images by eliminating many of the jagged edges and video artifacts seen when viewing interlaced content and features powerful color control to ensure videos are not too dark, overly bright, or washed out. I've owned several laptops and would be considered an intermediate to advanced computer user. I've built my own desktops, tweaked a few laptops and owned various brands of laptops including HP, Fujitsu, Sony and Dell (Inspiron, Latitude and XPS series). I purchased this laptop directly from Dell based upon Consumer Report's November 2009 article recommendations where the Dell Inspiron 1545 was rated a 'Best Buy' for every day computing. I purchased it for my husband who will use it primarily for watching an occasional movie from Netflix streaming wirelessly on our home network, emailing to share jokes and videos with his friends, and browsing the Internet. After setting it up, which other than running into a snag with my home network was a breeze, and playing with it for about an hour, these are my impressions. + Comes with Windows 7 - no need to upgrade, and the 64-bit combined with the more than adequate memory makes things move nicely. Slightly different than Vista's look, but should be easy to use. + Adequate hard drive (mine came with a 320) for storing photos, videos and music. + Great 1.3mp webcam which delivers pretty nice snapshots (not too grainy) as well as excellent video (very little drag of movement). + Good speakers! Better than those on my Dell XPS, for which I paid 30% more less than a year ago. + Bright 15.6" display; nice size. I sometimes find the 13" on the XPS too small and the Fujitsu had a 17" which is fine for a desktop replacement but really adds weight to the overall unit.